Athens, Ga. – Animal migration patterns are changing as humans alter the landscape, according to new research from the University of Georgia. Those changes can affect wildlife interactions with parasites-with potential impacts on public health and on the phenomenon of migration itself. In a paper published in Philosophical Transactions of the Royal Society B, Leone Brown, a recent postdoctoral researcher at the Odum School of Ecology, and Richard Hall, a faculty member in the Odum School and the College of Veterinary Medicine's Department of Infectious Diseases, used mathematical models to explore the impacts of wildlife feeding on migration and disease. "One familiar example for that would be American robins, where widespread ornamental plantings of berry-bearing bushes in city parks and backyards means there's food for them in the winter, so an increasing fraction of them is staying north," said Hall. "That's a species that we know is an important host for maintaining West Nile virus in places such as New York City." People provide food to wildlife both unintentionally-think of raccoons rummaging in trash cans-or purposely, as with bird feeders or butterfly gardens. Either way, access to new food resources, especially if they're available all year long, can cause some migratory animals to stay put. Many animals migrate to avoid harsh winter conditions or to follow available food as the seasons change. But migration can have another important benefit. By allowing animals to escape from habitats where parasites have accumulated and by weeding out infected individuals that are not able to survive the journey, migration can reduce parasite infection in animal populations. When human-provided food resources allow some animals to forego migration and form resident populations, the consequences can be serious. For one thing, by the time migrants return, resident individuals may already be taking up breeding territories and resources, putting the migrants at a competitive disadvantage. And many of those resident animals the migrants encounter may be infected by parasites. "When you get resident populations forming, you might extend the parasite transmission season, and additionally if those residents are supported by food subsidies through the winter, the infected individuals might be more likely to make it through," said Hall. "So now these migrants are returning to areas where there's already a larger number of infected individuals, so those mechanisms for escaping parasitism become less effective." Another concern is that resident animal populations with supplemented diets might support more virulent parasites. "If you think about it from the parasite's perspective, killing too many of their hosts reduces the chances of onward transmission and could cause them to die out." said Hall. "So parasites that rely on migratory animals may have evolved to be more benign to their hosts during their strenuous migratory journeys." If supplemental food allows some animals to forego the rigors of migration and at the same time helps them survive infection, these resident populations might support the transmission of parasites that are more lethal to migrants. "Migration is considered to be a threatened phenomenon by some because of the many barriers resulting from human land use and activities," said Hall. "Providing food and shelter for wildlife in our backyards provides us with an important connection with the natural world, with associated benefits for our well-being and engagement with conservation issues. I don't want to say to people, 'Stop bird feeding,' but rather to adopt practices to ensure its benefits for people and wildlife alike." But there are steps people can take to minimize the unintended consequences. For example, people can help by planting native species in their yards that have a fruiting or flowering period that co-evolved with native birds, Hall said. 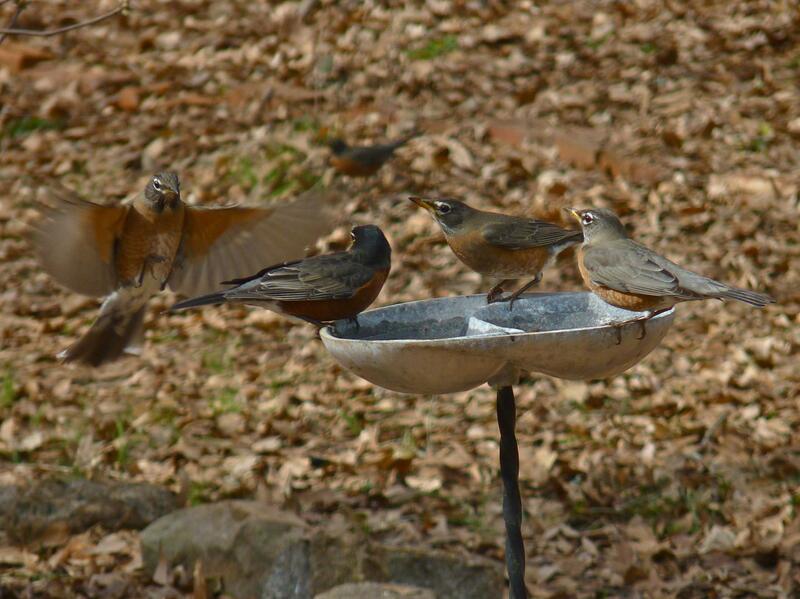 To prevent disease, those who use bird feeders should regularly sweep out seed husks and clean feeders and birdbaths, he said. It also helps to place feeders far apart from each other to reduce exposure to infectious pathogens. Funding for the research was provided by the National Science Foundation. The paper, "Consequences of resource supplementation for disease risk in a partially migratory population," is available online at http://rstb.royalsocietypublishing.org/content/373/1745/20170095. It is part of a theme issue on the topic of food provisioning and disease in wildlife edited by Daniel Becker, an Odum School doctoral student at the time who is now at Montana State University, Hall and current Odum School faculty Sonia Altizer, with Kristian Forbes of the University of Helsinki and Raina Plowright of Montana State.